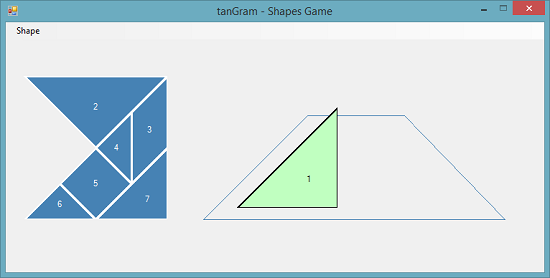 In this version of the game, there are the regular seven 'tans' or pieces, which are comprised of three different sized right-angled triangles, a square, and a parallelogram. There are five different 'target' shapes which are drawn in outline on the form as guidance. You can drag the shapes to a new location, and by double-clicking, rotate the shape 45 degrees clockwise. Conversely, double-clicking while holding down a Shift button on your keyboard will rotate the selected shape 45 degrees anti-clockwise. The 'target' shapes are selected via a menu strip. There is no testing to see if you've won, except your own judgement. Simply put, if you can arrange the shapes (in any order, and with any rotation) within the 'target' shape outline, you've won. This is a fairly simple application that uses OOP techniques, GDI+ and Control Regions to create an enjoyable, usable and quite challenging game, which requires skills and shapes perception that feature in MENSA tests.